Profile Liquid Soap Dispenser - 52 oz. 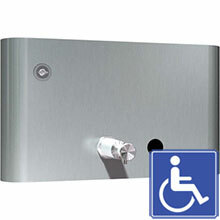 Profile Soap Dispenser - Surface Mounted - 48 oz. This visually appealing collection with rounded edges is manufactured with highly durable 16 gauge stainless steel doors and 20 gauge cabinets. Concealed heavy-duty 3/16" (5 mm) diameter piano hinges ensure smooth and long-lived operation, and rimless keyed-alike flush tumbler locks offer strong security with an elegant look.